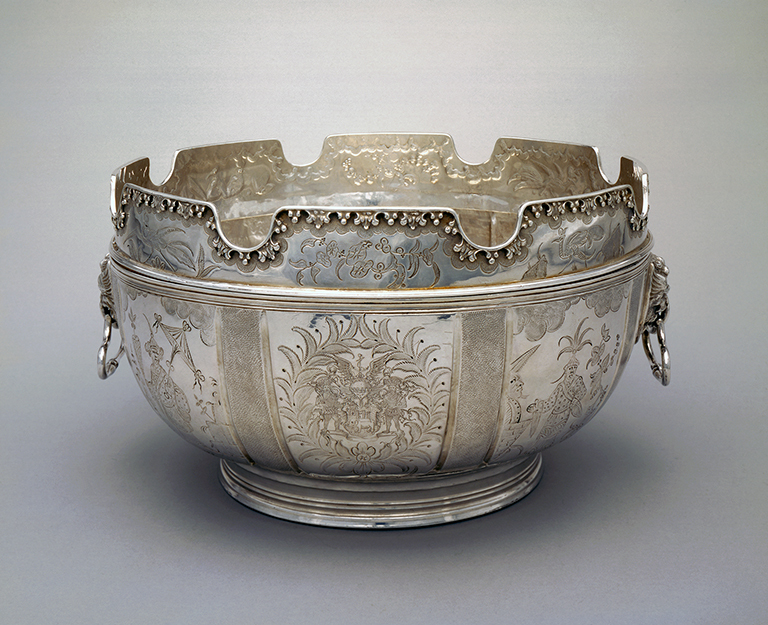 Monteith bowls, introduced to the most elegant dining tables in the seventeenth century, were used to chill wine glasses upside down, with the stems resting in the notched rim. 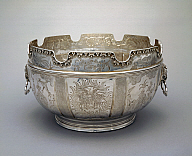 This monteith's body is decorated in the popular Chinoiserie style, with scenes depicting Chinese warriors and sages in elaborate costume. The central panel features the crest of the Royal African Company: two African figures flanking a coat of arms within a laurel wreath. The English company traded numerous such wares and commodities with West Africa, including having exclusive rights to the African slave trade from its founding in 1672 until 1698. Pandolfini Casa d'Aste, October 28, 2014, fig. 1, color illus., p. 58. Sloboda, Stacey. Chinoiserie Commerce and Critical Ornament in Eighteenth-Century Britain. Manchester Univ Pr, 2014, fig. 2.12, color illus., p. 77. Andera, Margaret, Nonie Gadsden, Britt Salvesen, and Laurie Winters. Collection Guide: Milwaukee Art Museum. Milwaukee, Wisconsin: Milwaukee Art Museum, 2004, pp. 16, 68, cat. 17, color illus. p. 16. Milwaukee Art Museum News, February 2004, cover (detail) and interior (no page number, color illus.